Microsoft has dropped a ton of Xbox Scorpio details, including core specs, via Eurogamer. There's a lot to process so let's drill straight to those all important console specs (and there's a direct Xbox Scorpio/PS4 Pro comparison here). Input/output options as per Xbox One S (so HDMI out, HDMI in, USB 3.0 port x 2 IR out, S/PDIF, Networking port, Lock port). According to the Eurogamer report the clock rates for the GPUs are "very high" and does achieve Microsofts stated six teraflop promise. Overall, the estimate is that the CPU is 30% faster than Xbox One while the GPU is 4.6 times faster. The big deal however is apparently the amount of high speed memory the console can use. Of that 12GB mentioned, 4GB is used for the system, leaving 8GB just for games, 5GB more than the Xbox One. A slight upgrade then. One example of the benefit that will give is "fast streaming of very high-quality art assets", suggesting that will help with 4K output. 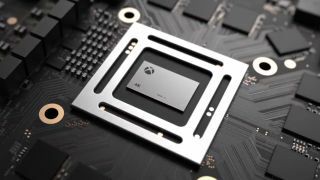 While it's not confirmed, Digital Foundry seem fairly sure Scorpio will be able to run a standard Xbox One 1080p game at 4K with little trouble. I'm currently drowning in details at the moment so stay tuned for more as we break it all down.